Indian army, along with the support from the Air Force, carried out a daring siege on terrorists, who had killed 18 of our soldiers on June 4, 2015. Though there are various reports on number of casualties on the terrorists side, it is heartening that all of our forces are back safe. Initial reports in operations such as these are always sketchy. Clearer picture of the number of casualties on the enemy side and the details of the operation will come out over the next few days. The operation was carried out during the early hours of June 9, 2015. Reports on the number of terrorists killed range from 15 to as high as over 100. Indian Army’s Special Forces comprising of 21 Para Special Forces, along with the Indian Air Force (with their Mi17 helicopters) carried out the operation. The terrorists were neutralized in two locations – one near the Nagaland border and another near the Manipur border. The decision was taken at the highest level by Prime Minister Narendra Modi and national security team, comprising of Defense Minister Manohar Parrikar, National Security Advisor Ajit Doval, Army Chief Dalbir Singh Suhaag. 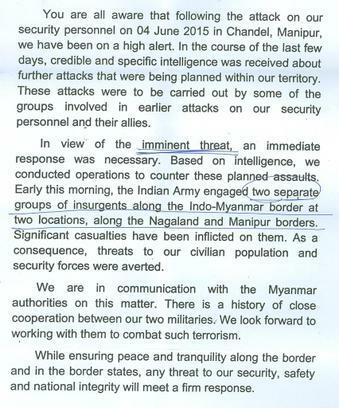 Ajit Doval was stationed in Manipur during the duration of the operation. Chief Suhaag had cancelled a trip to UK to command the operation. The entire operation was monitored live by the Prime Ministers Office. The press release said the operation was carried out “along the Indo Myanmar border”, where as Col Rathore has deliberately been not forthcoming about this. He has fluctuated between “along the border” to “inside the Myanmar territory” – though not in explicit terms. He said to the extent that – “India will go after the perpetrators to any length – at a time and place of India’s choice”. This can be interpreted as this operation was carried out in Myanmar territory. This is a smart ploy by the government to avoid nuisance from the Human Rights activists. If the operation was in the “Indian side of the border”, then there will noise from these activists about the merit in killing these terrorists and why not “just nab them”. On the other hand, as the scene of action was in “Myanmar side of the border”, these activists will have nothing to shout about. At best, they can make their complaints to the Myanmar government. This entire argument brings about the question, whether the Indian defense forces waited for these terrorists to enter the Myanmar territory and then decimate them. After all, Indian government had an agreement to enter Myanmar side. This has been a refreshing change in the way India has responded to attacks by terrorists. However, this needs to be put into perspective. As Nitin Gokhale, a noted defense expert cautioned, it would be foolhardy to expect similar strikes on our Western border. The enemy is different, the enemy is supported by the ISI and the enemy has access to a nuclear capable country. Hence, it is prudent to hold your horses than to expect similar operation to nab Dawood Ibrahim. 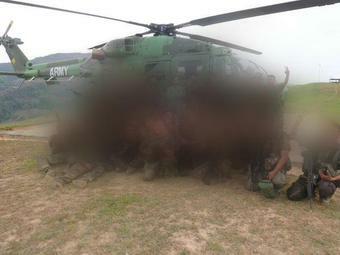 News agency, ANI released this blurred image of our heroes. Never inappropriate to pay homage to the faceless heroes who laid their lives and to the ones who avenged the killings in Manipur.